As a neuroscience major and music minor, Lizzy Stant ’19 has forged her own unique path at Swarthmore. Four years ago, Lizzy came in with little formal music training, having taught herself the guitar, piano, and voice, with some guidance from music choir directors at home. Attracted to the subsidized voice lessons and encouraged by a music program that works to offer equity for students from diverse backgrounds, Lizzy found her passion for music at Swarthmore. Over the past four years, Lizzy has participated in the Swarthmore Chorus, Garnet Singers,the staged opera Dido and Aeneas, and a number of smaller music ensembles; she traveled to Florence for a life-changing, three-week voice program; attended the Royal Danish Academy of Music her junior spring for a semester abroad; and embraced the challenges of taking music theory classes, though she’d never had any formal music theory training before coming to Swarthmore. Utilizing tutors and working closely with her vocal coach and teachers have been ways that Lizzy has navigated the rugged terrain of Swarthmore. Now as a senior, with palpable passion, Lizzy has achieved a confidence and direction that is so apparent in her day-to-day activities and conversations. Music and opera have become pervasive forces in her life, crossing over into other interests in environmental studies, neuroscience, and varsity athletics. 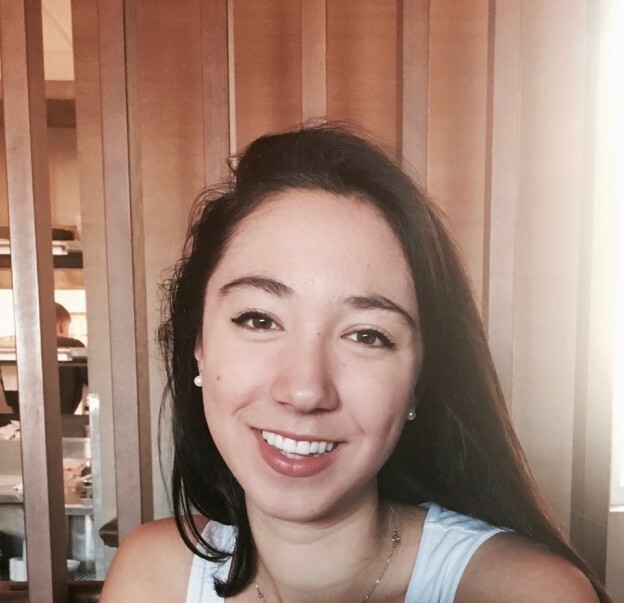 Lizzy will be performing cross-disciplinary pieces that use music to convey notions of nature, emotional and psychological healing, gender, and sexuality in her senior recital in April. She will be singing opera arias and opera duets with friends and fellow vocalists Emily Uhlmann, Omar Camps-Kamrin, and Shelby Billups; a set by Schubert focused on loss and mourning; a set by other European composers whose works use abundant nature imagery; compositions by African-American composer Florence Price, whose work Lizzy found and fell in love with while doing research on female composers; a musical theater piece; and her token audition song, “Animal Passion,” a piece that uses animal imagery to describe sexual desire and female sexuality. Her senior recital on April 13th at 3pm in Lang Concert Hall will be a culminating showcase of just a fraction of her accomplishments at Swarthmore. This entry was posted in Music on March 29, 2019 by dpulley1. This spring, the Swarthmore College Lab Orchestra will be performing Prokofiev’s “Peter and the Wolf” alongside a narration of the fairytale. Composed in the early 1930s for a children’s theater in Russia, “Peter and the Wolf” combines a children-centric approach with the musical nuance and variation that adult audiences can also find appealing. Professor Andrew Hauze of the Music Program hopes that the piece’s duality will draw an array of audience members to the 10am performance on April 6th, targeting college students as well as families with young children. “The great thing about ‘Peter and the Wolf’ is it’s a piece you can enjoy at absolutely any age because the music is so terrific and unsimplified. Though the music is very clear and approachable, it isn’t in any way simplified. So if you’re an adult who’s been listening to music your whole life you’re still going to find it interesting and compelling,” remarked Professor Hauze. Yet at the same time, as a narrated fairytale, “Peter and the Wolf” accesses a child’s imagination and delights in its colorful representation of characters. The outline of this peculiar fairytale begins with Peter, a young boy playing in the woods outside his house, and a bird and a duck who are constantly teasing each other. Peter’s grandfather, a rather grouchy character, scolds Peter for playing outside and warns him about wolves that might be prowling in the area. And as soon as Peter goes inside, a wolf does indeed show up. For the rest of the fairytale, Peter, the bird, and the duck devise a plan to distract and catch the wolf. Towards the end of the tale, hunters show up in pursuit of the wolf, but instead of shooting the creature, the entire group brings the wolf to the zoo; and there, the story ends. The story’s visual imagery and clear narrative have helped Shira Samuels-Shragg ’20 lead the orchestra. 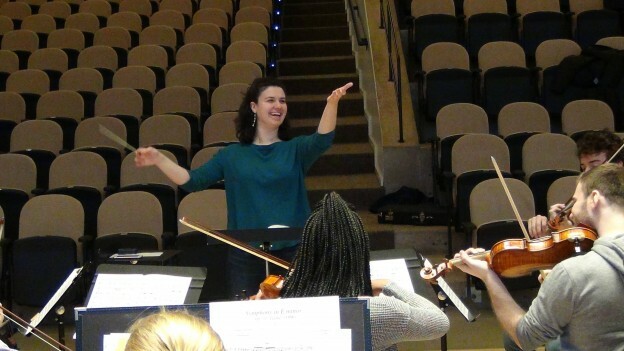 As the only current advanced conducting student, Samuels-Shragg has had the opportunity to rehearse with the Lab Orchestra for two hours each week with Professor Hauze’s guidance. “One of the challenges for a conductor is getting inside the piece and figuring out what the music is saying, and what is fun about this piece is that there is no guesswork; there’s the narration and it’s a very explicitly told story. We have very visual imagery to work with, so having a literal cornerstone is helpful and fun,” Samuels-Shragg said about the rehearsal process. In addition to explicit visual imagery and a straightforward narrative, “Peter and the Wolf” has specific instrumental representations for each of the characters: the bird is played by the flute, the duck is the oboe, the cat is the clarinet, the grandfather the bassoon, the strings are Peter, the horn is the wolf, and percussion are the hunters. All of these instruments constitute a 25-piece orchestra this semester, in addition to narrator Josie Ross, and of course conductor Samuels-Shragg. Since its inception three years ago, the Lab Orchestra has taken on a variety of fun and unusual projects, including playing in the pit for dance concerts at the Lang Performing Arts Center and performing at the Pennsylvania Academy for Fine Arts. This spring’s project of “Peter and the Wolf” is another fascinating musical work to add to the Lab Orchestra’s diverse repertory. “Peter and the Wolf” will be performed by the Lab Orchestra at 10am on April 6th at Lang Concert Hall at Swarthmore College. This entry was posted in Music on March 20, 2019 by dpulley1. Amy Barston began her Swarthmore College Featured Artist residency in fall 2018, hosting master classes with student chamber groups and playing the famous Dvořák Cello Concerto with the Swarthmore College Orchestra. On March 29th, Barston returns to Lang Concert Hall alongside pianist Ieva Jokubavaciute to perform a full-length concert program. Barston is an accomplished solo and ensemble performer as well as an acclaimed private cello teacher, giving lessons both from her home and through the Juilliard Pre-college program. She regularly plays as a soloist with orchestras around the world, and is a member of the critically acclaimed Corigliano Quartet. Since her graduation from the Curtis Institute of Music, Ieva Jokubavaciute has been wowing critics and audiences all across Europe and North America. Jokubavaciute is the pianist of the award-winning Trio Cavatina, and an assistant professor of Piano at the Shenandoah Conservatory. Barston and Jokubavaciute have an extensive and exciting set of repertoire planned for the upcoming concert, starting with the classic J.S. Bach Arioso fromCantata no. 156, followed by a series of more contemporary works for solo cello, consisting of the fiddle tune “Julie-O” by Mark Summer, Giovanni Sollima’s “Lamentatio,” and “Poucha-Dass” by Francois Rabbath, rearranged from its original designation for solo bass by Barston herself. The first half of the concert is concluded with the lyrical and virtuosic Polonaise Brillante for cello and piano by Frederic Chopin. The second half of the concert will feature Samuel Barber’s Sonata for Cello and Piano, and conclude with Béla Bartók’s Romanian Folk Dances. Andrew Hauze ’04, who connected with Barston last summer and helped coordinate her visits to Swarthmore this year, expresses his excitement to see Barston in concert. 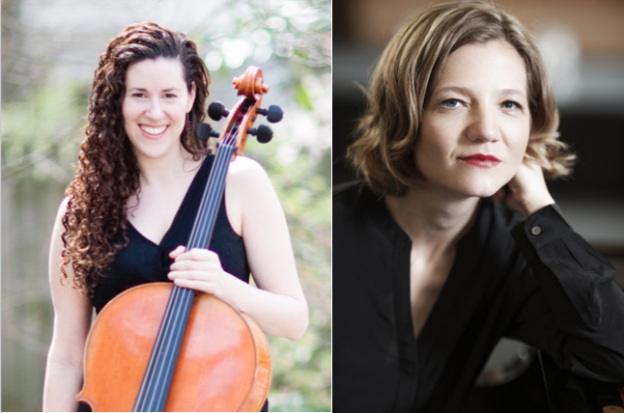 Amy Barston and Ieva Jokubavaciute will perform in Lang Concert Hall on Friday, March 29th at 8:00 P.M, and Barston will give a master class with Swarthmore musicians on April 5th 4:00 P.M., also in Lang Concert Hall. This entry was posted in Music on March 19, 2019 by dpulley1. Regan has taken a number of music-related courses, some of them academic, such as The Art of the American Musical with English Professor Eric Glover, and Opera History with Professor Barbara Milewski. She has also taken more practical classes, such as the private voice lessons offered through the Music 48 course, Modern Dance with Jumatatu Poe, and participated in various musical recitals and groups, including the Swarthmore Chorus and Garnet Singers (of which she is the soprano section leader). 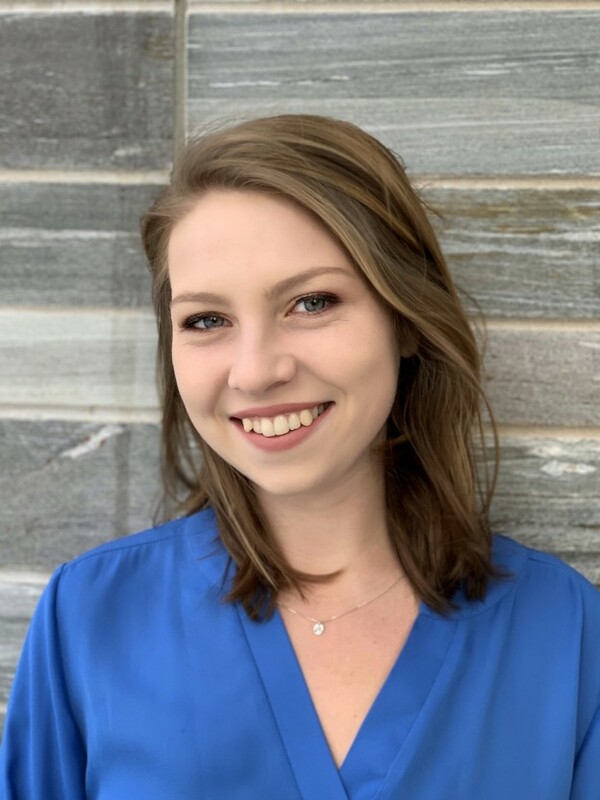 The Fetter Chamber Music Program has allowed Regan to explore her musical interests; she has been regularly involved in the program since Fall 2017, and was in the ensemble of Dido and Aeneas in her freshman year. This year, she is part of the Opera Ensemble. In addition to classical music, she is interested in musical theater, and has performed in Drama Board’s Broadway Miscast event (a cabaret-like show) and the Fetter-funded performance of the opening number from Into the Woods. Regan continuously proves that all students, no matter how packed their schedules are, can be involved in Music and Dance. While Rebecca’s plans for her future are far from concrete, she knows that she’ll keep pursuing what she loves. “Music is an integral part of my life and it would be hard to imagine not having music there at any point in the future. I mean at the end of the day,. I sing for myself. I sing because it brings me joy.” As for her future in English, she’s committed to continuing her education, but is looking for a few years of life experience outside of academia first. 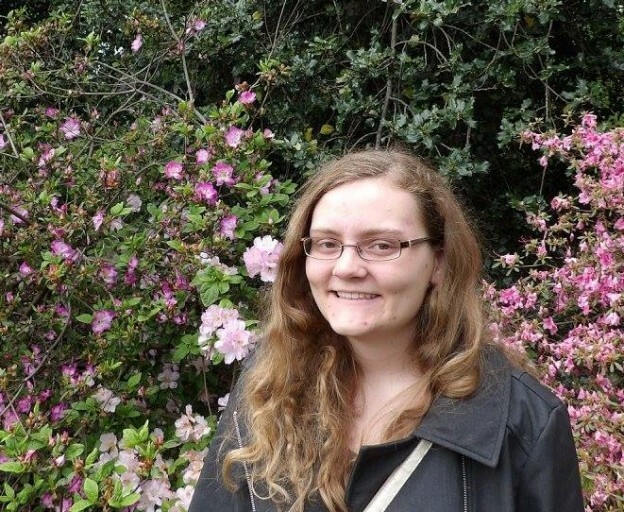 Rebecca Regan’s senior recital will be on Saturday, March 23rd, at 8:00 P.M. in Lang Concert Hall. The program is composed of art songs by nineteenth and early twentieth-century composers such as Reynaldo Hahn, Ernest Chausson, Franz Schubert, Paolo Tosti, and Amy Beach. She will also perform opera arias by Georges Bizet and George Frideric Handel. Dance Program Associate in Performance LaDeva Davis, who teaches Tap technique and repertory at Swarthmore, received the 2019 Innovation Award in Dance Development last month at the Mann Center’s “Voices of Hope:” Black History Month Celebration. As a part of the event, the Mann Center honored four iconic educators throughout Philadelphia whose work and determination have greatly impacted the lives of the city’s students. We congratulate LaDeva for her well-earned accomplishment! This entry was posted in Dance on March 10, 2019 by dpulley1. While Swarthmore’s Dance Program is fairly small, it offers students several opportunities to pursue their passions, often by working closely alongside professors. Marion Kudla ‘19, an Honors Dance minor, has taken classes in a variety of styles, from African dance to yoga; participated in performances every semester since her freshman fall; and is currently choreographing her own dance piece as part of her Honors thesis. This entry was posted in Dance on March 8, 2019 by dpulley1. On Friday, March 22, Christopher K. Morgan, founder of the dance company Christopher K. Morgan & Artists (CKM&A), will arrive at Swarthmore College to perform Pōhaku, a solo dance theater piece that combines storytelling, hula, modern dance, classical music, and projection design to explore themes of the native people of Hawaii like land loss and fractured identity. Morgan will also take part in a residency on campus where students will have a chance to interact with him, learning about the Native Hawaiian culture including dances like hula. 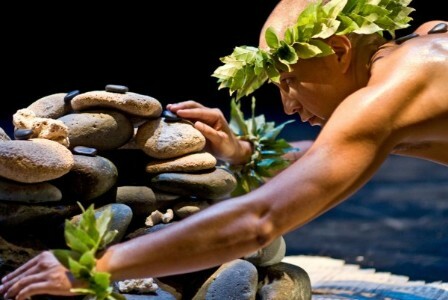 Pōhaku is Morgan’s first work integrating mele (music) and hula with Western practices, leading him on a far deeper and richer understanding of his multiracial identity than anything he could have ever dreamed. Professor Olivia Sabee of the Dance Program and Professor Alba Newmann Holmes of the English Department found inspiration in Morgan’s experiences as a Native Hawaiian growing up under more Western influences, and wrote a grant to bring CKM&A to campus based on the idea and themes of homeland. This grant aims to bring together students, faculty, guest artists, and staff members to create dialogue and performances that engage with one another’s understanding of homeland. These events are co-sponsored by the President’s Office Andrew W. Mellon Grant, and the performance will take place in the Lang Performing Arts Center on March 22 at 8 p.m. This entry was posted in Dance, Music on March 8, 2019 by dpulley1.